“Catch & release” is a term used when a molecule is temporarily bound either ionically or covalently to a functionnalized silica and subsequently released. This is either done to facilitate purification or synthesis. 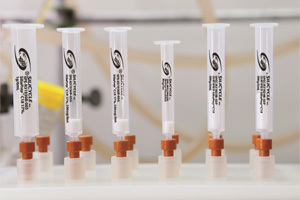 A very popular example of “Catch & Release” purification is the purification of amines with Si- Tosic acid (TsOH) also known as Strong Cation Exchanger (SCX). TsOH will catch the basic amines out of the reaction mixture allowing all other impurities to be washed away with a neutral solvent such as MeOH or DCM. The amines are released by switching to a basic solvent such as 5% ammonia in MeOH or triethylamine in DCM. 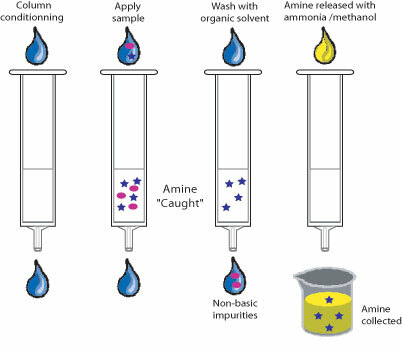 “Catch & Release” purification normally involves an ionic interaction, and is readily adapted to a SPE format for automation. “Catch & Release” synthesis is the interface between solution and solid phase synthesis. The scavenger may act as an activating, or a protecting group. For example, Si-TsCl can act as a bound tosylate to activate alcohols and Si-Diol can protect ketones and aldehydes by forming the acetal or ketal. Once bound, additional transformation maybe performed before the molecule is finally cleaved. The solid support facilitates purification through multiple transformations.